July 24, 2013 - India’s IndiGo Airlines employee falls 25 feet to his death at Netaji Subhas Chandra Bose International Airport, India. Debasish Dev, 30, was a customer service ramp supervisor that was overseeing the cleaning of an IndiGo Airlines Airbus A-320 on Wednesday when he walked through the A-320 aircraft door unaware that there was no ramp. The incident had occurred about 3 AM local time. Deb was preparing the aircraft for a morning flight when he exited the aircrafts rear door when he fell onto the concrete surface causing massive head injury. Dev Was pronounced dead at the scene of the accident. Coworkers reported that Dev gained employment with the carrier in 2007, was hard working, careful and his coworkers would seek out his assistance. They referred to him as the "professor". A spokesperson for the airline reported that that a ram is always provide at the front door and that a ramp is not provided for the rear door and when the door is opened it is done so to air out the aircraft and when the rear door is opened a there a caution tape is strung across the door to warn its employees. It is believed that Dev had backed out of the doorway not realizing he was so close to the door. Some feel that these kinds of accidents happen because of worker fatigue from long work hours and that the airlines should do a better job in employee safety. “Caution tape is not the answer. There should be something like nylon straps running across the door and latched” said an employee. IndiGo Airlines released a statement that said "While we are investigating the cause of the death, we continue to work with local authorities and the airport officials to investigate the accident. This is a very difficult day for us and we are trying to come to grips with the tragedy." 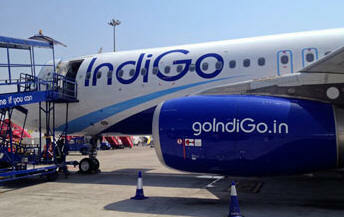 IndiGo Airlines is a private, low cost carrier based in Gurgaon, Haryana, India. The airline started operations in August 2006 and currently is the largest airline in India by market share. The airline is also one of the fastest growing airlines in the world.